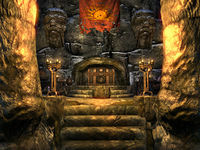 The Shrine of Mehrunes Dagon is the shrine to the Daedric Prince Mehrunes Dagon, and is located in the mountains to the south of the Pale. You can find the shrine if you go east from Stonehills until you reach the Hall of the Vigilant. When facing the hall, there is a stone marker leading up a steep hill to the right, just beyond a rocky outcropping. The easiest way to reach the shrine is to head southwest from the Lord Stone. Before the related quest is completed, you will only find the stone altar in front of the locked door (key required). After completing the quest, you will find that the two Dremora will respawn every 10 days and will attack on sight. Upon entering, you will be in an ice formed tunnel. Follow it until it opens into the shrine proper and deal with the two Dremora inside. There is a raised area in front of you with stairs leading up, and also stairs at both the eastern and western ends of the cave which lead up to the south. These are separated by large stone pillars. Turning to the left as you enter the main cave, you will find a large urn against the north wall. Against the east wall is an open chest containing two ebony ingots and four gold ingots. There is a fifth gold ingot in front of the chest, which will drop almost fully into the ground making it impossible to get unless you pick this up before any of the ingots in the open chest (this will happen every time you come here, and once fallen it will stay that way). Follow the stairs in front of the open chest to an unlocked chest, also against the east wall. In the southeast corner around a lit brazier is a plate, a bowl of bone meal and a salt pile. To the right, against the south wall is a sideboard containing two refined moonstone ingots, three further gold ingots, a random enchanted helmet, a bowl of ectoplasm, a bowl of glow dust, an empty greater soul gem, a spell tome of Firebolt and an empty unlocked strong box. In the center of the south wall is an unlocked boss-leveled chest. To the right of this leaning against the south wall is a staff of banishing. To the right of this is another sideboard containing a second empty, unlocked strong box, a copy of the Enchanting skill book Catalogue of Armor Enchantments, two bowls of glow dust, three gold ingots, a filled grand soul gem, a filled petty soul gem, an ebony ingot, an elixir of strength, and another random enchanted helmet. In the southwest corner around another lit brazier is a plate, a bowl of bone meal and a bowl of frost salts. In front of this against the west wall is another unlocked chest, and further to the right of this is another large urn and an open chest containing random boots. There is a final large urn against the right hand stone pillar as you enter, opposite the second urn. One moonstone ore vein is located 130 feet west-northwest of the shrine. On the opposite side of the peak the statue of Dagon is carved into is a stash of items, including a randomly enchanted helm and war axe, along with a couple potions, a handful of gemstones, a burial urn, and a chest. It is to the right of a stone cairn and beneath a stylized dragon glyph. The related quest must be completed to find anything except the stone altar at this location. At the end of the quest two high-ranking Dremora will attack you, both carry copies of a key which opens the door to Dagon's shrine. The shrine also becomes useful when you want to start smithing Daedric armor and weapons. After killing the Dremora, you can loot their hearts. The Dremora may not respawn at the shrine, even after waiting 30 in-game days. However, leveled loot will continue to respawn inside. This page was last modified on 17 January 2016, at 02:50.